Sumitomo Dainippon Pharma is realigning its research and development organization with a view toward accelerating the creation of innovative new drugs. One of the initiatives in this regard is to rename the Drug Research Division (in the Japanese language only) in October 2017. In order to strongly boost the drug discovery research projects, we have applied a "Project-based Research Management System" by appointing Project Leaders and Project Directors in the Drug Research Division. The Project Leaders are primarily responsible for advancing the drug discovery research projects that they are in charge of, while the Project Directors are responsible for strategic proposals regarding conceptual ideas of new research programs and enrichment of research portfolio in the Drug Research Division as a whole. The Drug Research Division will work as one team to effectively maximize the research outcomes, advancing the drug discovery research projects and increasing the research success rate. The Project Leaders will take the initiative in such research team efforts. In the Oncology area, under the global R&D system established by Boston Biomedical, Inc. in the United States, Tolero Pharmaceuticals, Inc. in the United States, and the DSP Cancer Institute in Japan, the Sumitomo Dainippon Pharma Group aims to continually create innovative products. In the Regenerative Medicine/Cell Therapy field, Sumitomo Dainippon Pharma aims to create innovations that take advantage of leading-edge science and technology, such as iPS cells, in the Regenerative & Cellular Medicine Kobe Center established in Kobe city in Japan. 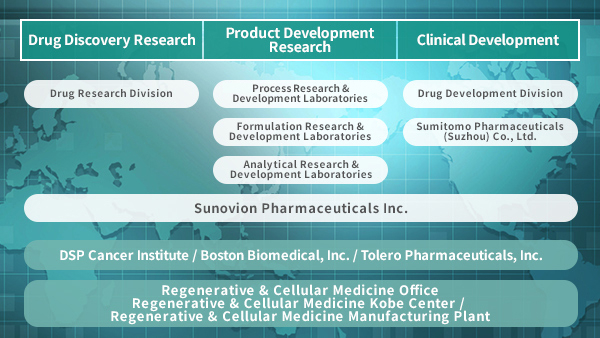 Clinical development activities are carried out through close collaboration among our development teams in the Drug Development Division in Japan, Sunovion Pharmaceuticals Inc. in the United States, and Sumitomo Pharmaceuticals (Suzhou) Co., Ltd. in China. Sumitomo Dainippon Pharma Group will strengthen seamless operation to promote clinical development in a speedier and more efficient manner under the Head of Global Clinical Development. Product development research is headed up by three research facilities within the Technology Research & Development Division, i.e., Process Research & Development Laboratories for technology development of active pharmaceutical ingredients (API), Formulation Research & Development Laboratories for technical development of drug product, and Analytical Research & Development Laboratories for analytical technology development of API and drug product. These facilities work together to advance research related to production methods and the quality of API and drug product in the process of development and application for approval of pharmaceuticals. The Technology Research and Development Division also maintains a system to enable the global supply of investigational drugs, including quality assurance.